The earliest concept involving the theory of scanning electron microscopy was first introduced in Germany (1935) by M. Knoll. The standard concept of the modern SEM was constructed by von Ardenne in 1938 who added scan coils to a transmission electron microscope. 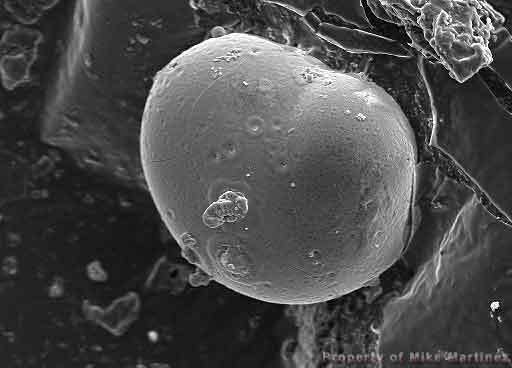 The SEM design was modified considerably by Zworykin et al. in 1942 while working for RCA Laboratories in the United States. The design was again re engineered by C. W. Oatley in 1948 while a professor at Cambridge University. 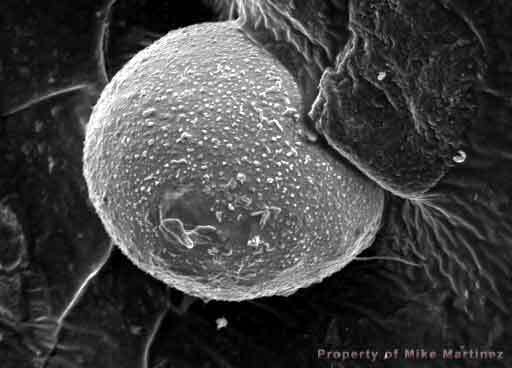 Since then there have been many other significant contributions that has greatly enhanced and optimized the modern day scanning electron microscope. 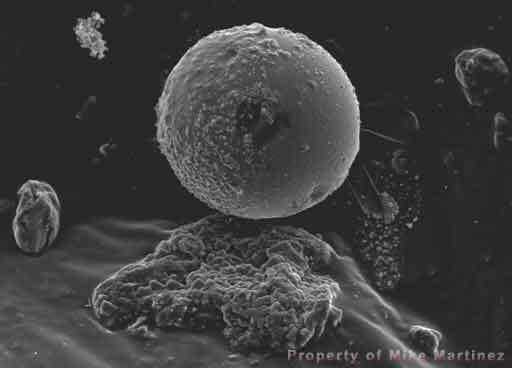 The principal of a scanning electron microscope or SEM functions by scanning a finely focused beam of electrons onto a sample. The impinging electrons interact with the samples molecular composition. The energy of the impinging electrons onto a sample is directly in proportion to the type of electron interaction that is generated from the sample. A series of measurable electron energies can be produced which are analyzed by a sophisticated microprocessor that creates a pseudo three-dimensional image or spectrum of the unique elements that exist in the sample analyzed. It is this series of electrons which are deflected by collisions with the samples electrons. Before exploring the types of electrons produced by a typical SEM, a basic understanding of the theory surrounding classified elements of the periodic table needs to be mentioned. Georg Bauer a sixteenth century metallurgist. Robert Boyle (1627-1691) who carefully measured the relationship between the pressure and volume of gases. George Stahl (1660-1734) who postulated that a substance burning in a closed container eventually stopped burning, a term he called "phlogiston". Joseph Priestly (1733-1804 was the first to discover oxygen or as he called it "dephlogisticated air". Antoine Lavoisier (1743-1794) who discovered the law of conservation of mass. Joseph Proust (1754-1826) who showed that a given compound always contains exactly the same proportions of elements by weight, this is also known as the Law of Definite Proportion. It was the work of Proust that inspired John Dalton (1766-1844) to develop his hypothesis into the "Law of multiple proportions": When two elements form a series of compounds, the ratios of the masses of the second element that combine with 1 gram of the first element can always be reduced to small whole numbers. There needed to be a system for relating this information in an easily understood manner. A Russian chemist named Dmitri Mendelèev (1834-1907) arranged the 63 known elements into a table based on their atomic mass. This arrangement of the elements eventually transformed into the modern periodic table of the elements used throughout the world. Through the hard work of these men and a host of others, an enormous amount of information was compiled and tested to establish the basic underlying principles used today in the development of the modern scanning electron microscope. The mass of a fixed number of atoms of an element. The standard scientific unit for dealing with atoms in macroscopic quantities is the mole (mol), which is defined arbitrarily as the amount of a substance with as many atoms or other units as there are in 12 grams of the carbon isotope 12C. The number of atoms in a mole is called Avogadro's number, the value of which is approximately 6 x 1023. The atomic mass of an element expressed in daltons, or more commonly atomic mass units (amu's), is the number of grams in one mole of the element. The amu is convenient because atomic masses are nearly equal to atomic mass numbers and therefore are close to integer values. (Encyclopedia Britannica). Before exploring further into the theory and functionality of a SEM/EDX microscope, it is worth mentioning the duality of electrons and x-rays. Early experiments with electrons and its physical characteristics have led scientist to modify their basic understandings of physics. Before the advancement of modern day technologies, many scientists had to explain physical behaviors based on chemical interactions that were seen with the naked eye. When the principles of electro magnetic radiation was first introduced, the concept was easiest explained as waves that travel in specific lengths and frequencies. Later experiments showed that light and x-rays are actual particles that can be detected. In short, x-rays are considered as both waves and particles. More specifically, they are small packets of electromagnetic waves called quanta or particles called photons. 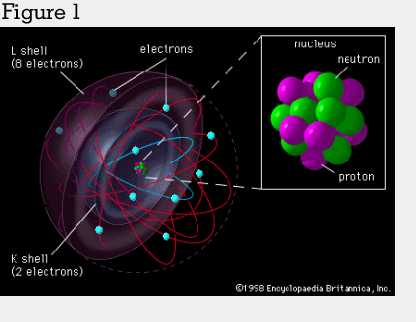 Each element is comprised of a nucleus and a series of orbiting electrons (Figure 1). The nucleus or Z value is the combined weight of the positively charged particles (protons) and uncharged particles (neutrons). The negatively charged electrons, each only 0.05% as heavy as a proton, orbit the nucleus. The electrons orbit the nucleus of an atom in a series of levels. Each level or shell is designated K, L, M etc. depending on its relationship to the nucleus of the atom. The K shell is closer to the nucleus and each additional shell is farther away. The number of electrons that orbit an atom depends on the molecular weight of that atom. For example, helium (Z=2) has only two electrons in the K shell; Gold (Z=79) has two K electrons, 8 L electrons, 18 M electrons, 32 N electrons, 18 O electrons and 1 P electron. Orbital angular momentum. Chemists follow the conventions of optical spectroscopy using letters rather than numbers to indicate the value of l: sharp (l = 0), principal, (l = 1), diffuse (l = 2), and fundamental (l = 3). In the absence of an external magnetic field, the magnetic number has no meaning and will be ignored in the subsequent discussion. The normal atom is electrically neutral, meaning that it carries a net electric charge of zero. 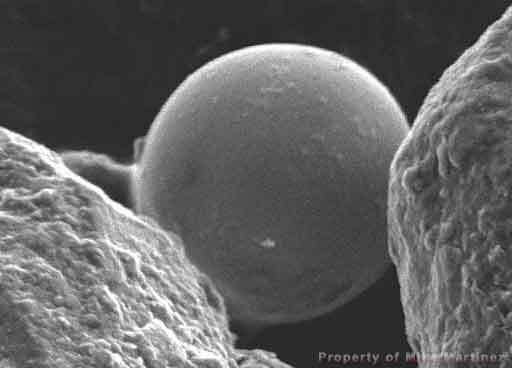 Some atoms, however, have lost or gained electrons in chemical reactions or in collisions with other particles. Atoms with a net charge, from either the gain or loss of electrons, are called ions. If a neutral atom loses an electron, it becomes a positive ion; if it gains an electron, it becomes a negative ion. Depending on the type of information an analyst is interested in depends on the type of electrons one studies. Every electron that is generated from the primary electron beam produced by the SEM when impinging a given sample produces an electron of specific energy that can be measured. The types of electrons generated for any given sample needs to first be explored. The electrons produced from a samples molecular composition are classified as either elastic and inelastic electrons. Backscattered electrons- yielding topological, compositional and crystallographical surface information. Absorbed current- which enables the study of the internal structure of semi-conductors or (EBIC). Cathodluminescence- shows the distribution and energy levels in phosphors. Auger electrons- contains elemental and chemical information of the surface layers. Characteristic X-ray Radiation- yields microanalysis and distribution of elements of a given sample. 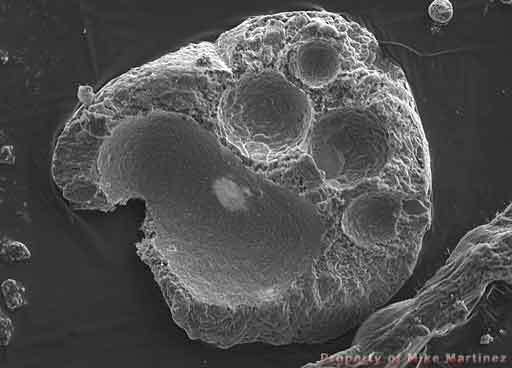 A typical SEM has the ability to analyze a particular sample utilizing any of the above mentioned methods. Unfortunately, each type of analysis considered is an additional peripheral accessory for the SEM. The most common accessory equipped with a SEM is the energy dispersive x-ray detector or EDX (sometimes reffered to as EDS). 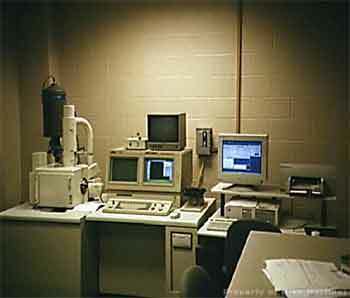 This type of detector allows a user to analyze a samples molecular composition. The first known detection of x-rays was discovered accidentally by the German physicist Wilhelm Conrad Roeentgen in 1895 while studying cathode rays in a high-voltage, gaseous discharge tube (It was known that when the cathode of an electric circuit was heated in a vacuum with a large potential difference applied between that cathode and the anode, a beam appeared to travel between the two electrodes. Originally this was thought to be an electromagnetic wave, and so they were called cathode rays, J.J. Thompson (1856-1940) created the cathode ray tube-CRT the basis for modern-day computer monitors and televisions ). Since the exact reason for the phenomena was not know at the time, Wilhelm Conrad Roeentgen coined the term "x-radiation". The electromagnetic wavelength of x-rays are about 0.01 to 100 angstroms (An Angstrom (abbreviated Å) is one ten-billionth (1/10,000,000,000) of a meter. A hydrogen atom measures about 1 Å across). In an SEM, x-rays are produced by accelerating the primary electron beam with enough current to pass through the sample thereby interacting with the elements inner core electrons. When enough high-velocity electron bombardment contacts the inner most electron shell of an atom, it forces the orbiting electron to be kicked out. Subsequently, this results in the neighboring outer electrons to move into the vacant inner electron shell. The release of energy from the escaping electrons from the inner most orbiting shell or core electrons are analyzed and measured based on their classification type. The two types of escaping electrons are classified as either being of high energy or low energy electrons. The first type of escaping electrons to be discussed are the low energy electrons known as the Auger effect first observed in 1925 by the French Physicist Pierre-Victor Auger. 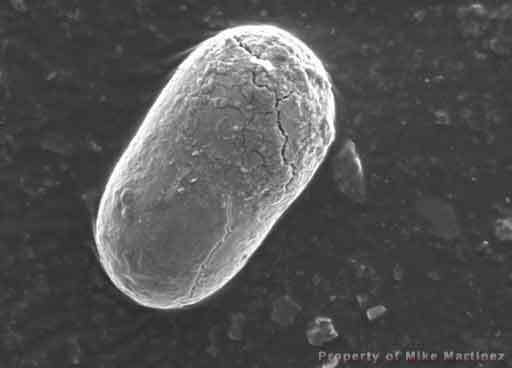 This phenomenon occurs when an electron is released from one of the inner orbiting shells thereby creating two electron vacancies of the residual atom and is repeated as the new vacancies are filled or x-rays are emitted. It should be noted that the detection of Auger electrons or specific Auger yield for a particular element decreases with atomic number. For example, the emission of x-rays and Auger electrons of Zinc (atomic number 30) is about equal. This type of analysis was developed in the late1960's and called Auger Spectroscopy or AES. The technique is useful in studying the qualitative and quantitative surface layer composition of compounds, elements or subatomic particles known as muons. Characteristic x-rays are escaping high energy electrons produced from the bombardment of energetic electrons on the orbiting inner most electron shell of an atom, thereby leaving a vacancy. An electron from the outer orbiting shell then jumps into the empty electron vacant shell. The emitting energy, called a photon or minute energy packet of electromagnetic radiation is specific for each element in the periodic table. The deceleration of the beam electrons when hitting a sample or passing through the field of atomic nuclei is measured and is known as bremsstralung or braking radiation. The energy loss is continuous and dependent on the incident electron voltage and angle of incidence. The exact calculations for the specific values of energies are calculated using the Hartree Theory and Bethe process. The data is extrapolated from mathematical formulas via micro processing into a readable spectrum for analysis. Bremsstrahlung is the main source of X-rays produced by diagnostic X-ray tubes. The energy dispersive (EDS) and wavelength dispersive (WDS) systems both have benefits and disadvantages. The main differences between the systems are in detector efficiency and resolution. Schematic diagrams showing the components of the WDS and EDS systems are shown in Figure A and B. Figure A. Schematic representation of a wavelength-dispersive spectrometer (Goldstein et al. 1981). Figure B. Schematic representation of an energy-dispersive spectrometer (Goldstein et al. 1981). The overall efficiency of collecting the X-rays produced is poor for both WDS (<0.2%) and EDS (><2%) with the EDS better because the detector is closer to the sample. Most X-rays produced from the sample do not make it to the detection systems. In a WDS system about 30% of the X-rays entering the detector are actually counted; whereas, in an EDS system about 100% of the incident X-rays are counted. As a consequence, the minimum useful probe spot size is larger for WDS (about 2 µm). The greater efficiency of EDS permits the use of beam diameters as small as 50 Å (0.05 µm). ><0.2%) and EDS (<2%). The EDS system is better because the detector is located closer to the sample. However, the resolution of the WDS system is far superior (Figure C). Figure C. Comparison of the resolution of the proportional counter, SI(LI) semiconductor detector, and several analyzing crystals. Note that the axes are logarithmic (after Maurice et al. 1979). Most X-rays produced from the sample do not make it to the detection systems. In a WDS system, about 30% of the X-rays entering the detector are actually counted; in an EDS system, almost 100% are counted. As a consequence, the minimum useful probe spot size for WDS is about 2 mm; the greater efficiency of an EDS permits the use of beam diameters as small as 50 Å (0.05 mm). IAMA is an acronym for the International Association for Microanalysis and was formed October of 1999. The organization is non-profit and was created to provide forensic scientist with an informative resource relating to the detection of primer gunshot residue (P-GSR) by SEM/EDX. Currently, IAMA is internationally recognized with over 150 members. Although, IAMA was originally created to address a the specific topic of P-GSR detection and analysis, eventually it is anticipated to grow into a journal comprising all aspects of forensic scanning electron microscopy. The International Association for Microanalysis (IAMA) is a not-for-profit organization. IAMA is funded by myself, the generous donations of others and membership dues. If you or your organization would like to contribute to IAMA, please go to the Contact section of this web site and fill out the information provided. Other inquiries on retaining the services of forensic experts in criminal or civil investigations can also be made through the Contact section of this web site or visiting www.iamaweb.com. Interested individuals will be immediately contacted and provided with the necessary information requested. *All of the information and photos were found online over time. The purpose is for educational use only.